Bud was a wonderful man. I only got to know him after Bob died but kept in touch with him thereafter. I loved to listen to his stories about the war. They only made one of him and I am blessed to having known him. My thoughts go out to his family. They had a great Dad. Patti and family, I am so very sorry to hear of your dad's passing. Your dad was a remarkable man, spreading his wealth of knowledge with so many of us. My thoughts and prayers are with you all, but I know that he is soaring above the heavens and watching over you forever. Mr. George was my homeroom teacher when I was Class President my senior year at Northeast HS. He guided me/us through all of our Senior Class activities. Having such a bright, happy, full of life teacher to greet you every morning was really special. Enjoyed his stories too. My thoughts and prayers go out to his family and his son Tom who was a classmate. What a wonderful gift to have had such a warm, welcoming, fascinating neighbor. Rest in peace, dear friend. God Rest your soul Bud! What a wonderful Gentleman, with a wonderful family! Be at Peace with Gloria and Bob! Col. George made history come to life and ignited a lifelong fascination for the stories that shaped our past, present and future. He was kind, cheerful and engaging. My sincere condolences on your loss. I will be giving thanks formhis life and legscy in my own prayers. What a true Gentleman Harry was. We enjoyed talking to him in the halls of The Grande. We will miss his smiling face. God Bless you Harry. Rest In Peace. Harry was a hero in my eyes ,and a great neighbor . I will miss seeing him at the mailbox and the hallways of the Grande . He always had a big smile ,and something nice to say to me. Harry and his Family will be in my prayers and thoughts ! What a gentle and loving personality Col. Harry was, My condolence goes to the entire family and my prayer is that the Lord Grant the family and all loved ones the fortitude to bear the loss. May hi gentle soul rested in peace. My sympathy goes out to your family. I too was from the graduating class of 77. Mr George was my all time favorite teacher during the 4 years at NEHI. He made a impact on all of us with his interesting way of teaching, and his joy of life. I'm sorry to hear about your Father. He was a special man. In fact I can say, I was blessed to be a part of your family growing up in the neighborhood, both he and your mother help shape me, as us all, to be the people we are today. As my teacher in Northeast High have gave me a true passion for geography and history. As my friend, he came to visit me in Hawaii so many years ago...I think it was around 1980. He would enlighten me with his stories as we toured Oahu, where he stayed for R&R after being shot down and his role as a pilot in WW II. Every story was fascinating. I was so appreciative to have him visit me when I was so far from home. We had a blast! I have such respect for him... because if there ever was a time in History, when the world was on the brink of destruction it was HIM...and men and women like him that allowed us to have the lives we do today. As a mentor, a teacher and a role model I am a better person to have known him. I am so sad to hear of your Fathers passing. He was a man of broad depths, Family, Military, Teaching, Please find solitude in your Fathers Legacy and Memories of Colonel Harry's Georges well lived Life. Lt. Col Harry "Bud" George: Fly High, Soar with the Angels and join the love of your life, Gloria, as your eternal reward awaits your spirit. Frank and Manuella Clark. for the loss of the Patriarch of this group of fine people. Col. Harry George welcomed not only the two of us as Theresa's parents, but our entire family of 5, and their full families, into the George extended family. Accepting each and everyone us as we are, regardless of the quirks, or baggage we might bring with us. What an example they have set for anyone who has had contact with them. An honorable, practicing, patriotic group of people. Over the last nearly 27 years we have continued to have this very special relationship. What a legacy you have left behind Col. Harry "Bud" George. The lives you and Gloria touched will continue to be enriched just because you were on this earth, and shared so much with so many. Again, Fly High, Soar and you join your loved one's who have gone on before you. Our world is better because of your presence in our lives. Thinking of so many great memories of your Dad! He was always so happy and sure enjoyed life!! What a wonderful man Harry Is. So glad to have known him. Great stories and great member of the Grande Community. I salute you Col George . (Sarge James Maint The Grande. While researching my brother, Sgt Harold P. Peterson, also a member of the 6th Bomb Group, I spoke with Harry. I also became phone friends with Clarence Pressgrove. He spoke of Harry and their travels together and speaking events they shared. Both have passed so I am speaking for them. God Bless. I am the son of another 6th Bomb Group Association member who is also no longer with us, John R. Creek, Sr. I wish to relay my condolences to your family over the loss of a wonderful man. 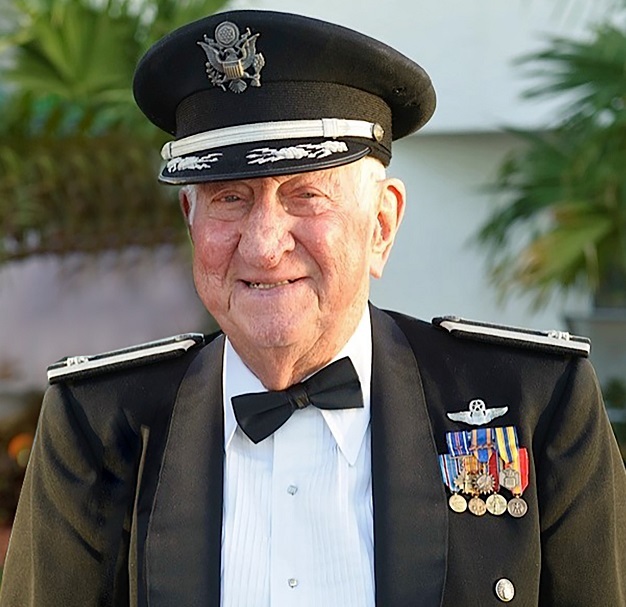 I was fortunate enough to meet Col. Harry George for the first time in 1994 at the 50 th Anniversary of the first flight of the B-29 Superfortress. He had the most fascinating stories to tell of his life on Tinian Island during WWII. He attended many, many of our Association Reunions all over the Country. I personally always looked forward to seeing and talking to him again. Because of his deteriorating health Harry had been unable to attend our Reunions for the last few years. To accommodate this traveling disability, we planned our next Reunion in Treasure Island, Fl. only about 10 Mi. south of Harry’s home for this Sept. This was to be in Harry George and Jack Koser’s HONOR to get both of them to one more Reunion with their old War Time HEROS of the 6th. It is with a sad heart that I announced to our Group Harry will not make it to this one. We will be talking and thinking about his many, many contributions, not only to the 6th Bomb Group Association, but our entire Country over many years. We will miss you at our Reunion, Harry. It is with great regret that such a wonderful man, father and grand-father passes. He was blessed with a full life at 96 and what a beautiful life story it was!. I am sure he will be missed. 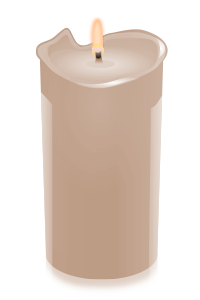 We send you our deepest sympathy and condolences during these difficult times. Mr. George has lived a good long life and deservingly so. I too went to Northeast High School and even though I never had him as a teacher, I got to know him better through his son Tom of whom I hung out with and spent may a days around the George household located only a few blocks from my parents home. Mr. George was always willing to give you his time and loved to talk about his military past even writing stories down for me of which I still have today. Mr. George rest in peace. I never met Harry but I talked with him by phone once about the 6th Bomb Group--my father was also a B-29 pilot and I was researching his experiences on Tinian. Harry was delightful to talk with, and I've always appreciated his generosity. Thank you, Harry. My father, Ralph C. Wilson, was an airplane commander in the 40th squadron in the 6 Bomb Group on Tinian along with Harry George. My husband and I have been attending the reunions the last few years and have heard so many wonderful stories about Col. George. I was really looking forward to meeting him in Florida at our next 6 BG Reunion. We are sending our condolences to his family and hope that their memories will be consoling. We were honored to have met Harry some years ago and spend time with him in Clearwater. My father was a CFC with the 6th and that's how the connection began. Harry shared with us many wonderful stories, not just about WWII but of his family, all of which he loved and admired very much. For the short time we knew him, he was always a joy to be around. Lunches with Harry at Guppies with Ellen will be remembered with fondness. Harry was always a true gentleman in every sense of the word. He was one of the greatest of the greatest generation and will remain in our hearts forever.